US stocks saw deep losses in Thursday trade amid escalating trade tensions as President Donald Trump planned to unveil roughly $US50 billion in tariffs on Chinese exports. Industrial, financial, and technology stocks led major indexes lower. US stocks declined Thursday as President Donald Trump announced roughly $US50 billion of annual tariffs on Chinese exports, stoking fears of retaliation and roiling markets worldwide. Industrial stocks led the way lower in the both the benchmark S&P 500, which fell as much as 2.6%, and the Dow Jones industrial average, which dropped more than 3% – or 744 points – at one point. 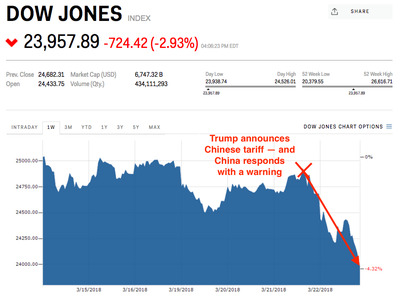 The Dow is now down 10% from its recent peak. The more tech-heavy Nasdaq 100 index lost at least 2.5%. Among the industrial firms worst hit were Caterpillar, Deere, and Boeing, which all dropped at least 4%. The sector has typically absorbed the brunt of selling on trade-war flare-ups as the situation has escalated over the past few months. Elsewhere in the US equity market, financials were among the biggest decliners a day after they exploded higher. The industry’s outsize strength on Thursday followed the Federal Reserve‘s decision to hike interest rates and maintain its pace of monetary tightening. Technology shares were also under pressure as the industry grapples with the looming specter of regulation following Facebook‘s recent high-profile data breach. Selling pressure in equities was also felt in overseas markets, as the Shanghai Composite lost 0.5% and the Stoxx Europe 600 declined 1.6%. In the bond market, the 10-year US Treasury yield slid 8 basis points to 2.83%, though it’s still close to the key 3% level that traders are closely watching. And even though Treasury yields declined Thursday, Bank of America Merrill Lynch maintains that a trade war will move them higher in the medium to long term.